This map provides an illustration of our main area of service provision but we have successfully completed jobs for customers further afield. 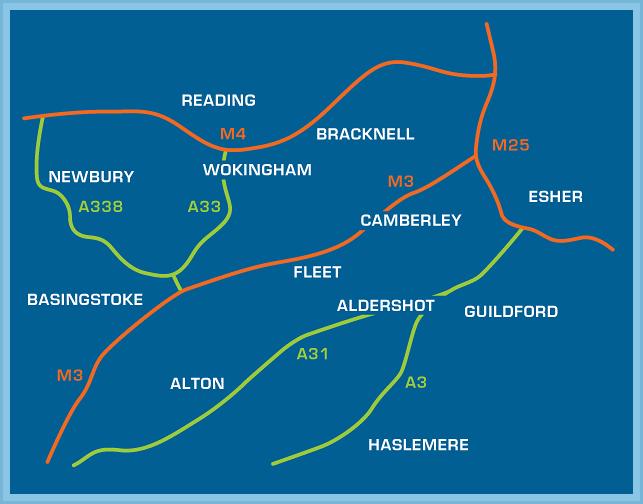 Aldershot, Alton, Basingstoke, Bracknell, Camberley, Esher, Farnborough, Farnham, Fleet, Guildford, Haslemere, Hook, Newbury, Reading, Woking, Wokingham, Yateley, and everywhere in between! •Remember - WireITfree engineers are ready to help you during evenings and weekends too ! - no extra charge for this service. •Would you like a PC built to your specifications? No problem - call WireITfree NOW to build one for you in seven business days. •Did you know that WireITfree provides technical support for business servers? •Bought new equipment? Now, call WireITfree (01252 621852) to set it up for you. •New equipment not an option? - WireITfree can help you maintain your existing systems. •WireITfree will be offering their VoIP telephony service imminently. Please contact us ( 01252 621852) for more details today and to find out how you can save money, immediately, on your phone calls (local, national and international) .! •Install a small business multi number VoIP system - ask WireITfree for details. •The WireITfree on-line shop has been launched - click here. •Call us now for your LAN /Wireless LAN installation and extension.We will also supply the best and appropriate parts for your needs. •We cannot wait to help you our valued customers ! Telephone: 01252 621852, Mobile: 07956 410790, Email: info@wireitfree.co.uk, GU51 5TY, Fleet, Hampshire,Broadband services, Computer hardware, Computer software, Computer/system health checks, Data storage, Data transfer, Database design, E-Mail, Equipment purchase, Internet access, Mobile device integration, Networks (wired/wireless), Printers, Server management, Telecom services, Viruses, VoIP, Web hosting, Website design, Aldershot, Alton, Basingstoke, Bracknell, Camberley, Esher, Farnborough, Farnham, Fleet, Guildford, Haslemere, Hook, Newbury, Reading, Woking, Wokingham.